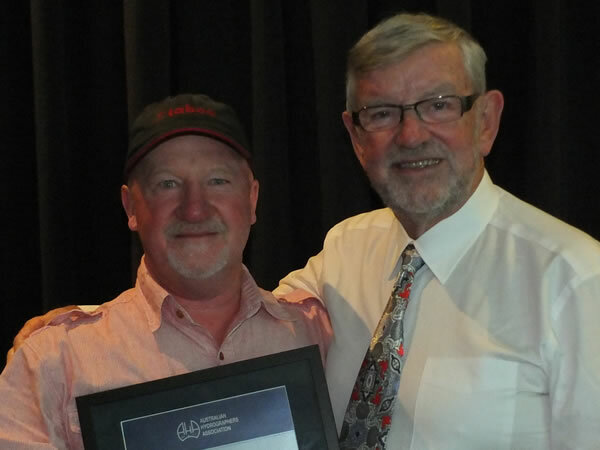 Des Sherlock was inducted as a Fellow of the Australian Hydrographers Association with Life Membership on Tuesday 13 November 2018. Des Sherlock started his career as a cadet engineer with (WC&IC) Water Conservation and Irrigation Commission, NSW. On achieving his qualifications, he specialised in the Hydrographic Branch, WC&IC. In 1950 he was sent to Albury, with a wild group of young ex-servicemen, to set up the river gauging and rainfall network for the Snowy Mountains Authority. There were very few access roads and so they hiked and rode horses in the summer and cross country skied in the winter. In 1952, this network was handed over to the Snowy Mountains Authority. Soon after he was appointed as District Hydrographic Engineer in Armidale and then in the late 50s was promoted to Hydrographic Engineer Operations, overseeing all field work across the whole of NSW. During this period, Des started developing, locally made field equipment for our Australian conditions, as he could not see the value in some of the overpriced imported instruments. His Hydrographic Group developed the original Hydrography Certificate Course, run through Sydney Technical College of External Studies. In 1965, frustrated by his bosses’ refusal to finance the equipment he was developing, Des resigned and went home to Picnic Point to start the Hydrographic Instrument Co which later changed to Hydrological Services in 1969 to reflect more on its work. At the Warwick Farm site, which was conveniently located on the Georges River, equipment test and training facilities were built for powered traveller-units, manual traveller winches and a 50 metre deep calibration bore for gas purge water level instrument calibration. Additional facilities were built as each new product was developed. The most impressive of these test facilities, being the rating tank, built in the early 90s, during Des’s semi-retirement. This was the most accurate tow tank in the world at that time. Des is, and has been a keen supporter of the AHA from its inception. He was the first financial sponsor, and provided facilities for AHA meetings and related social events. Training was provided to customers for free at the Warwick Farm facility and to customers overseas in association with hydrological projects. When Des finally retired in 2000, he had given nearly 60 years to our hydrographic industry in Australia and to about 40 other overseas countries. Des is the father of our hydrological manufacturing industry in Australia. Congratulations Des for your significant contribution to the profession and your appointment as Fellow of the Australian Hydrographers Association.